When did theatre audiences get so wussy? One of the Whingers’ new year resolutions is to pose more questions. Not because we don’t know the answers (we do) or are interested in the opinions of others (we clearly aren’t), but because it seems to be a popular device beloved of Guardian blog sub-editors – you know the kind of thing – What theatrical experience are you dreading this year?, What were your productions of the year?, Why are UK ovations on the rise? – so we thought that we would give it a go. Now the point is that the latter question (the one about ovations) is a good question, but the wrong question. The right question is “Why don’t audiences boo any more?”. When did they get so wussy? It seems that these days the most radical thing ordinary people (i.e. the Whingers) are prepared to do to express their disappointment is either to walk out in the interval (or preferably just before it) or blog caustically about it afterwards. Phil did once try to reintroduce the custom of booing at the end of Resurrection Blues but it didn’t catch on – not even with Andrew who had agreed to boo along but was too intimidated by the frosty stares of the couple sitting next to him who looked like they lived in Weybridge. To be fair, that was two years ago and the Whingers haven’t sat through anything nearly as bad since then. But perhaps theatre-goers’ standards have fallen. Opera-goers, on the other hand, still cheerfully boo occasionally at bad productions. To help cover the costs of rebuilding the theatre once it had burned down the management was raised the prices of admission when it reopened in 1809. 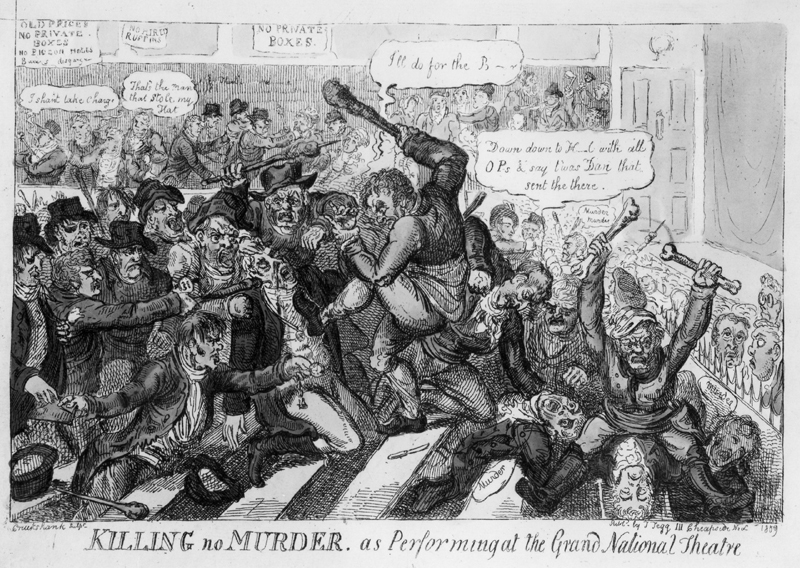 On the opening night, riots broke out during a performance of Macbeth and continued throughout the play. Reiterated shouts of ‘Old prices, Old prices’ greeted both [actor-manager] John Philip Kemble and Sarah Siddons each time they appeared on stage. The noise was such that 500 soldiers were dispatched to the gallery, but the rioters climbed down to the lower galleries, the sight of the soldiers merely increasing the antagonism of the house. ‘It was a noble sight’ said the Times, ‘to see so much just indignation in the public mind’. Indeed. The riots lasted for 64 days until Kemble capitulated, reduced the prices and made a public apology from the stage. We’re not sure what’s going to tip us over the edge – it could be the bar prices, the programmes, the state of the toilets or even the show. Feel free to join in. This entry was posted on	Saturday 5 January 2008 at 12:29 pm	and is filed under booing, entertainment, general whinging, London, Old Price Riots, Resurrection Blues, theatre. I thought about booing too. It’s rare for me, since I usually feel for the performers when a show is a dog, but I was once dragged out of an opera by an embarrassed husband for booing energetically… mind you, then I was very provoked by the ovations that were taking place around me, so it mightn’t count. I have never booed but have often felt like it. The most drastic action I have taken is to refrain from taking my seat after the interval when the production is showing no signs of improvement as, in these circumstances I take the view that I have already wasted the ticket price and there’s no way that I will waste the rest of the evening as well. Alison Croggan sounds to have experienced the same feeling that I often have, where the star’s groupies are in the house and are determined to reward a lacklustre performance with wild and ecstatic applause. I went to see Montiverdi’s ‘Orfeo’ staged by Opera North in Leeds last January and it was the first night.The music and singers were fantastic but the staging was horrendous. A woman was masking taped to the wall and during some of the swoonsome music, all you could hear was the sound of masking tape being pulled from a roll. There was a lot of what can only be described as “inappropriate groping” too which made me lose my concentation. On stage – sadly not anywhere near me. At the end, the cast and orchestra got a sympathetic applause but when the designer, Christopher Alden, came on he got booed. In Leeds. Can you believe it? Unfortunately, the people truly responsible for a lousy production aren’t generally the ones onstage to take the boos. I know enough actors to have sympathy for those compelled to carry out a contract for a dog, and so am usually not able to boo. Though I’m not above simply not clapping at all. Oh how I would love to boo. Ironically, it’s often during performances where the entire audience gives a standing O. The worst productions don’t have intervals so you can’t boo or leave.eg. A Matter of Life and Death. And then perhaps a lot of provincial theatregoers (yes, I know that sounds patronising, but you know what I mean) who don’t go very often, feel they’re having a big night out and don’t want to admit that it wasn’t great and they wasted their money. Especially if they’re in a big group with relatives who’ve paid for the “treat”. The NT’s big Xmas show in 2006 Once In a Lifetime fits that category. It was terrible. We left at the interval, but it had a big gilt staircase that rose out of the revolving Olivier stage and it got the audience terribly excited.